RC cars have been a known form of entertainment and toy, not only for kids but also for adults. They have also become a hobby for many people over time. RC car kits have become more popular than the RTRs or Ready-to-Run ones since the user gets hands-on experience in building the car. When playing with a kit, you also have a wide knowledge of the inner workings of your RC car since you built it yourself. The best thing about RC car kits is that you get to see and put your hands on every single part. That way, you can easily do your own repairs and maintenance. The building process helps give you the confidence to work on the vehicle in the future for thorough maintenance, adjustments, and repairs. RC car kits don’t only give you the chance to run and control your mini car, you also get the experience of building it. These kinds of toys will be beneficial for a person’s building, assembling and problem-solving ability. In these kits, you also get to lube the differential, set the gear mesh, align the wheels, and tighten every screw. The fine-tuning options and modifications of RC car kits are also unlimited. You can even easily increase their performance at your own pace and according to your preferences. Remote control cars have different parts and components and in they are generally called “kits”. These RC Car Kits are a box full of the different parts that you can assemble and put together. When you choose kits, you choose to build your RC car from scratch or from the ground up. Basically, you just have to build everything on your own before you get to run and race with it. Some kits contain just the bare parts or framework while others come pre-assembled. What most people love about these kits is that they are super flexible, they allow you to put a lot of your own creativity and effort into your RC model. Through going through the whole building and creation process, you tend to make your RC car to be something that is truly yours. The creative and mechanical knowledge that you develop when building a kit is also invaluable. This will inspire you to keep your RC car in perfect condition while it’s up and running. 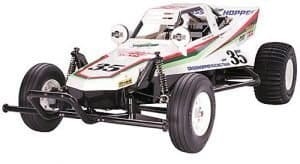 Tamiya has been always known to produce quality cars and this Tamiya RC car kit is not only best in performance but in appearance as well. The Petronas TOM’s RC F is truly an eye-catching RC car in more ways than one. This RC model assembly kit accurately recreates a car. It comes with complete distinctive spindle grille and side panel detailing on the polycarbonate body. Separate parts are packaged in the kit to recreate the unique and real-life-looking side mirrors. Marking stickers are included to recreate sponsor logos, numbers and the striking emerald green detailing. It has an adaptable TT-02 Chassis offers balanced shaft driven 4WD. It is a built with a highly adaptable chassis, as it offers 2 different wheelbases, 2 ground clearance settings, and 2 tread set-ups. Those are in addition to a range of 10 possible gear ratios. The shaft-driven 4WD TT-02 chassis employs a longitudinal layout with the battery positioned on the left and the motor on the right. This positioning gives excellent stability. In addition, it features identical left and right suspension arms and uprights for ease of assembly, plus easy-to-maintain gearboxes. It also looks really good and appealing, with brake disc-shaped wheel hubs and stylish front bumper supports. The Grasshopper RC car is based on the famous one-seater buggies that have been seen on the US dirt tracks during the 80s. This RC model boasts ease of assembly and ease of control. With a lightweight build, this RC car made an instant hit as a perfect beginner level RC kit. Additionally, it is compatible with a wide range of different parts and accessories such as oil dampers, 540 motor and bearings. Despite being a beginner level RC car, this still could keep pace with experienced owners. Packed with all the fantastic features of the original kit, this fun 2WD buggy is perfect and well-rounded on both off-road and on-road tracks. Whether it be for a beginner or experienced, the Grasshopper RC car kit guarantees to please. It has a simple but very durable and tough 2WD chassis. 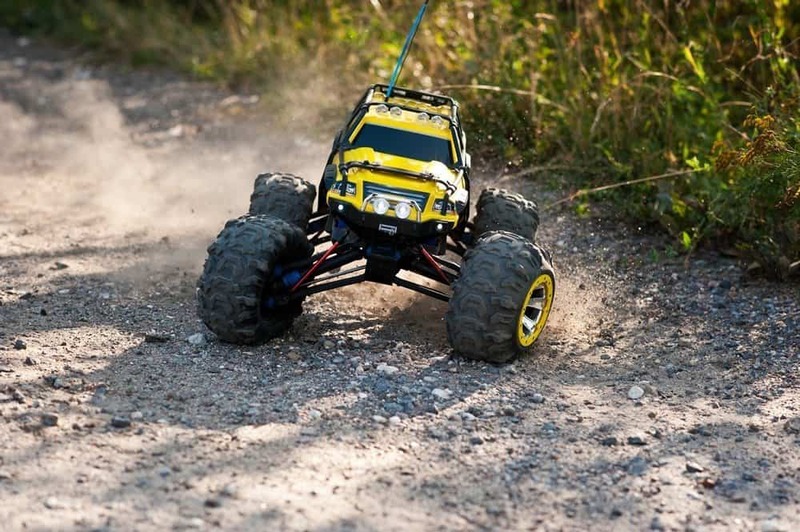 With a super solid frame, this RC car kit can absorb and handle any rough rides. Challenging tracks can be easily traversed credits to coil spring dampers, and solo swing axle front and rigid axle rear suspension. Its enclosed gearbox keeps the mud and stones out for easy rides and drives. The paddle style rear tires and grooved front tires are created for excellent grip when driving on dirt tracks. Its design and build adds that aesthetics to a cool looking off-road RC car. This 1/8 off-road buggy RC car kit by Team Associated is known to be great in different aspects, from build, maintenance, and ultimately racing. This remote control car model is completely designed from the ground up. The RC8B3 starts with a hard-anodized 7075-T6 durable aluminum chassis designed for optimum weight distribution. Also for good ground clearance, and better overall handling. As a result, the RC8B3 Team Kit changes directions faster and is more compliant, stable and easy to handle even in rough terrain. The RC8B3 boasts an updated suspension that features a pillow-ball front upright for maximum steering and durability. It has refined 16mm Big Bore hard-anodized aluminum threaded shocks and 3.5mm alloy shock shafts to provide plush suspension travel. The RC8B3 also features precision universal drive shafts at the front and rear. 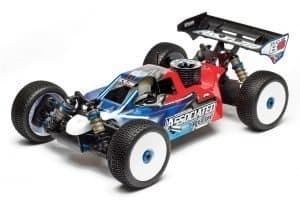 This RC kit by Team Associated is designed for easy handling and fast running. This kit, however, may need extra parts to make it fully operational. Team Associated RC cars are known to be champions in design and performance as well. 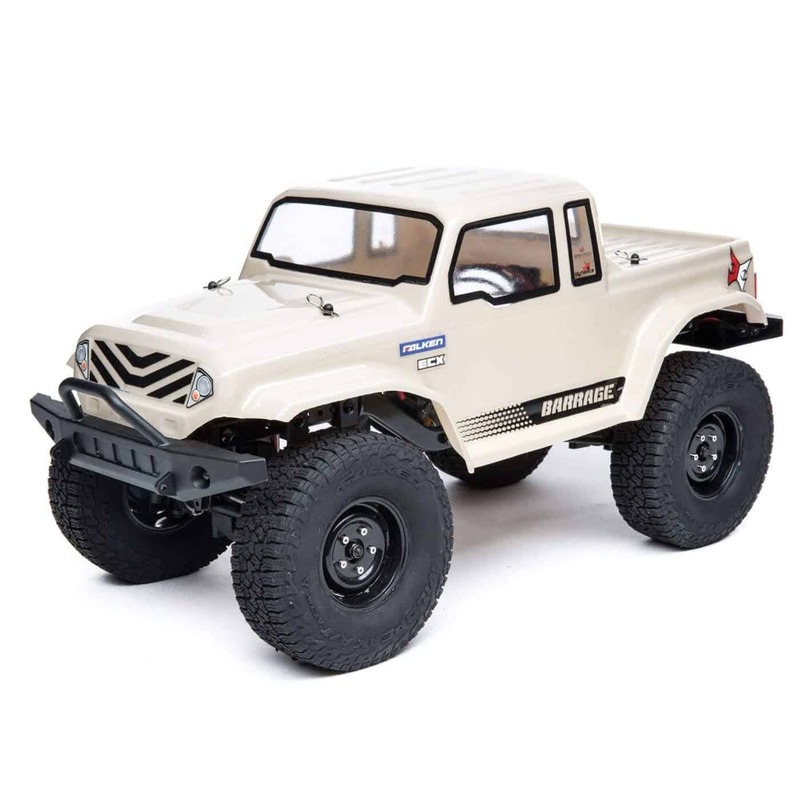 This 1:10 scale 2WD off-road has been Team Associated’s signature class and most well-known since the release of the RC10 in 1984. Divide and conquer! In today’s RC world, traction dictates your setup. With both B6 and B6D configurations available, getting to the top of the podium has never been easier. It can be raced on clay or dirt and will run perfectly fine. It boasts a hard anodized aluminum pocketed chassis and optional weights to allow weight bias tuning. This RC car features centralized motor positioning for optimum side-to-side balance. With this Team Associated RC Car, racing at multiple tracks, or where traction changes, has never been easier. Setups and tuning parts are interchangeable between the two configurations, making the B6 platform extremely versatile. Both versions come with the speed, durability, and lineage expected of a true champion. Choose the configuration that suits you and your track. This vehicle needs extra parts to make it operational, such as motor and battery pack. This off-road RC car kit is perfect for the little kids. 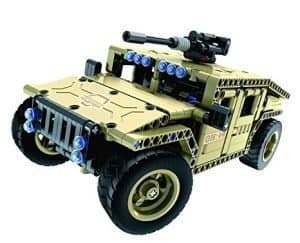 The Bo Toys RC Military SUV Building Bricks is a great product for developing small motor skills for children over 8 years old. The army SUV comes in easy-to-assemble 502 pieces, which will make building it a breeze for both you and your little one. And once you build it, the fun, playing, and racing begins. Through this awesome kit, kids can start their own adventure just like a little military commander. Made of ABS, similar to the material used by the leading brands of building bricks. It comes with a 2.4 GHz remote controller with up to 100′ RC distance enjoy more racing fun indoor and outdoor. This kit will also be a great addition to your collection. Makes a great toy for children who want to and takes interest in building a toy. 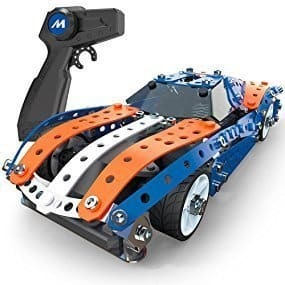 Also a great RC product for kids, the Meccano RC muscle car makes the cut for the best RC car kits. This one is an easy-to-construct remote control speedster that is perfect for both kids and adults. This can race wonderfully on open roads and indoors too. The RC car model is made with real metal parts by Meccano, for a high-end and durable build. 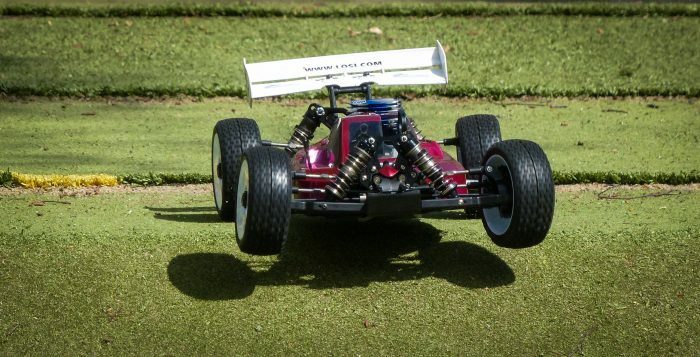 This 9.5” long RC model is capable of handling high speeds and turns. Whether riding solo or trying to win a race, this RC model delivers exceptional speed on the open road. The car features metal components–including steel girders, plates, nuts, and bolts–that hold the car together even in the event of a crash. The sturdy treaded wheels are designed to grip the road, offering added traction as the car whips across the pavement. The control ’s impressive communication range of 2.4 GHz, combined with multi-directional steering, enables this Meccano RC Muscle CAr to go exactly where you want. Not only fun, but this RC car kit is also a certified S.T.E.M and educational toy. Building this RC model will require you to draw on science, technology, engineering and math concepts in order to complete it. So, this is not only fun but also packed with a bunch of learning and building experience for kids too. Building a kit is a great learning experience since you get your hands and eyes on every single part when assembling them. You get to assemble or modify your RC car better than the default or factory specs. Upgrades or accessories may be installed. There will be no worries once you forget the assembly steps. Since, going through the building process will give you the familiarity and confidence to disassemble, fix, and repair your RC vehicle. When you assemble your RC car you get to understand its mechanisms and interiors even better. That way you get to know it from the inside out even better. Then it will be a lot easier for you to repair and modify your car. When something breaks or gets damaged, you will have more confidence to fix it on your own. Unlimited options when it comes to fine-tuning. When you build your own vehicle, there is greater potential for a precise and high-quality build. Great feeling of accomplishment and fun-filled learning experience. More opportunity and choices for customizing your car. Since you get to work with every screw and bolt, you also choose how you want to mount certain things and put better parts in the car. Tends to more expensive than the RTRs. Building and assembling your own RC car takes more time, effort, and experience. RC car kits will best suit experienced RC vehicle hobbyists. But they are also great for beginners who dare to take a bit of a challenge. Kits may require a lot of patience and perseverance. Not great for those who have unsteady hands or people with low confidence in their mechanical aptitude. But if you want to practice, we suggest that you start with something that is prebuilt and slowly get your hands with repairs and modifications. Some kits are not complete so you may need to purchase additional items and materials. 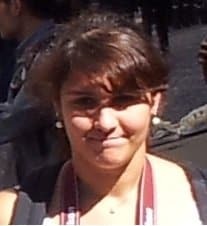 Errors in the assembly are possible. This type is the most common and most loved especially by those who are fond of racing. They are modeled after the average racing street cars. These cars are the fastest and best runs on paved and flat surfaces. This type of RC car will be best if you are planning just to use it inside the house or on paved tracks. Street Rc cars will not be ideal if you are looking to drive in your backyard or want something with more power and traction. Drift RC cars may look and appear similar to street cars. The only difference is that they have different and slick tires. 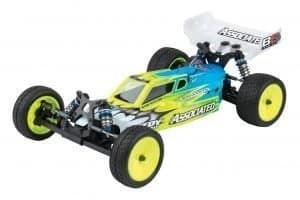 With this RC car, you can slide around turns, even sharp ones, and maintain the speed, They are good if you are up for more challenge since drifting can be difficult, but super fun at the same time. Buggy RC cars are a cross or mix between offroad and street cars. They are the second fastest on road but the slowest offroad usually due to their low wheelbase. Buggies are good for those who tend to be undecided when it comes to what type of car they want since they can be great for both. Truggies are also hybrids or crossovers like buggies. These truggies, however, are built more for the off-road tracks. It basically takes the frame of a buggy with monster truck tires. Trucks are those you have commonly known as the monster trucks. They work very amazing and stable off road but tends to be slow on the streets. These Truck RC cars flip a lot when trying to make high speed turns, making them not the best for on road. You should get this type if you want to drive in the woods, muddy tracks or in the grass the most. Some people may think that RC car kits are super complicated, draining, and time-consuming. Yes, they might be, if you get the wrong one. But once you get to choose the right one for you and your preferences, these kits will now become simple and super fun. Basically, you know that all the parts you have to build the thing will work together, you have instructions on exactly how to do it all and you know from the outset how much the whole thing is going to cost. Time and effort should be put into kits but at the end of the day, it will always be worth it! Most especially if you are someone who is more interested in the mechanical side of things than the flying or driving, then it’s a thousand times more worth it. Building cars from kits can be exhausting and frustrating, especially if you don’t really know what you’re doing, but keep at it and you’ll find that a kit is by far the most rewarding way of enjoying your RC hobby. The more you put in, the more you get out, and it’s quite as simple as that. That bit more satisfaction, sense of achievement, and ‘personal-ness’ about your model is so, so worth it, satisfying, and a project that you can totally make you proud of yourself and your creation. Not everyone can take on the challenge of building from RC car kits, but once finished and complete, the feeling of satisfaction and pride is like no other.